Clearly the best game available on launch day for the Sega Genesis, Thunder Force II is a shooter that was ported over from the Japan-only Sharp X68000. 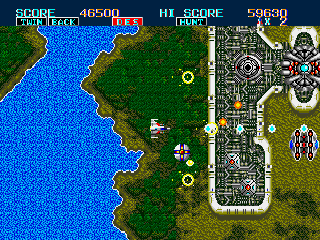 While the original Thunder Force, which was only released in Japan on a variety of home computer platforms, was comprised solely of free-roaming levels, Thunder Force II oscillates back and forth between free-roaming and horizontally-scrolling stages. The free-roaming levels require you to destroy several ground bases (see the picture at right) after which the level comes to an automatic end. The horizontally-scrolling stages play out like every other shooter, and culminate in end-of-level boss battles. There are a variety of power-ups to be picked up, but they’re specific to the type of level on which you obtain them. So your power-ups from free-roaming stages are unavailable on horizontally-scrolling stages, and vice versa. Tight controls are the cornerstone of any good shooter, and Thunder Force II feels great. The graphics are fine for such an early Genesis game, but some levels definitely look better than others. The one area in which this game is lacking is in it’s digitized speech, most of which is unintelligible. That being said, both the music and the sound effects are excellent. I found this game to be quite addictive, and was playing it daily when I first discovered it. It’s definitely tough, but it keeps you wanting to come back for more. The perfect combination of challenge and variety make Thunder Force II a must-own on the Sega Genesis. Buy Thunder Force II on GameGavel or Amazon. Tagged genesis, Review, sega, Shooter, Thunder Force II. Bookmark the permalink.